Selling “crunchy” baby body parts so a medical director can buy a Lamborghini? The largest domestic terrorist group is crying foul. It is readily apparent that the cries of Klan Barrenhood about being persecuted for 10 years by peaceful, prayerful, non violent pro-lifers ring hollow to anyone paying minimal attention to the abortion wars. They were also active behind the scenes in the persecution of IL pharmacists by the convict Rod “Slobodan” Blagojevich going back to at least 2005. “Slobodan” worked with Walgreens executives to harrass and fired pharmacists with a conscience–sometimes during the overnight graveyard shift–as he had the IL assembly pass an illegal act, later overturned by all competent courts on the matter. Even a diktat from a felon Serbian ex-governor does not trump civil and religious rights of pharmacists in the workplace. PP was right there, egging Blago on. 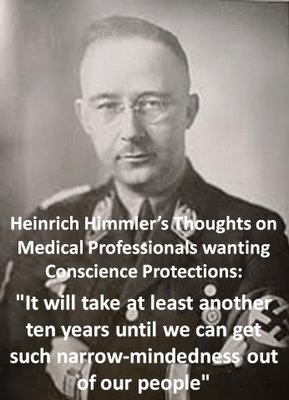 Says Pharmer in the same piece: “Planned Parenthood has been attacking pro-life health care professionals and Crisis Pregnancy Centers for decades.” Let’s not forget their role in various states working to illegally strip the rights of religion and conscience for pharmacists and other health professionals, as well as harassing CPCs, as they did in CT and NY under Client #9, the ex-gov. and ex-AG Sidney Blumenthal. This entry was posted in Abortifacients, Abortoholics, Contraception, Culture, Democracy, freemasons, History, Hypocrites, Klan Parenthood, leftists/communists/marxists, Medicine, Obamacare, Odd News, Pharmacist, Pharmacy, Politics, Pro-family, Pro-Life, Regime and tagged Gatter Planned Parenthood selling baby body parts. In a wierd volte face, the GOP is fighting and clawing for OTC abortifacients (e.g. the Pill, Plan B, etc) and the Dems and Klan Barrenhood–the largest domestic terrorist group–are fighting AGAINST the measure. At least as far as who will pay for these carcinogenic abortifacients. The bill upholds requirements in the Affordable Care Act mandating access to prescription birth control covered by insurance companies, so over-the-counter birth control would be covered without new costs. “I believe strongly that women should be able to get the comprehensive health care they need when they need it, without being charged extra, without asking permission and without politicians interfering,” Murray said. So do Republicans, according to Sen. Cory Gardner, R-Colo., who unveiled a GOP proposal late last month that also aims to make birth control pills available without a prescription. The bill makes good on a campaign pledge by Gardner in his successful election against incumbent Democratic Sen. Mark Udall. The race focused almost singularly on women’s health care and reproductive rights. Gardner’s bill would allow for over-the-counter birth control, and includes a proposal that would allow women to pay for it through health savings accounts. Gardner’s bill would put an age restriction for access to adults 18 years and above; Murray’s plan has no age restrictions. This will mean more chemical abortions, more womyn contracting various cancers from these toxic steroids, and more health care costs related to the hundreds of side effects that womyn suffer from these abortifacients. And if approved, that will mean less follow up and care for womyn procuring these carcinogens OTC. MEET THE ABORTION PILL TWINS!.. This entry was posted in Abortifacients, Abortoholics, Catholic, Contraception, Culture, Democracy, freemasons, History, Hypocrites, Klan Parenthood, leftists/communists/marxists, Medicine, Obamacare, Odd News, Pharmacist, Pharmacy, Politics, Pro-family, Pro-Life and tagged OTC Pill Republicans Cory Gardner Patty Murray. Although it may get some readings and generate some heat rather than light, the proposed bill in the OH Assembly–Abortion Inducing Drugs–will be DOA. Even if it were to pass the rigorous task of clearing the House and Senate, RINO Gov John “Janko” Kasich, busy getting ready for a presidential run, will also likely ignore it as well. 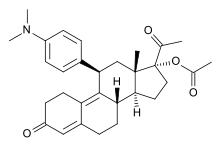 The bill only talks about the sole drug with an abortion indication–mifepristone–which is often used in combination with the protsaglandin misoprostol, the latter which increases contractions. the former which literally “starves” the developing baby of needed progesterone from mom early in the pregnancy. The news release from Cincy RTL, while well intended, only addresses one other drug used as an abortifacient, methotrexate (MTX), a drug developed for cancer and also used in certain drug-resistant forms of thematoid arthritis. It totally misses or intentionally ignores the other common abortifacients that makes some “pro lifers” squeemish and squirmy: the combination oral “contraceptive” Pill, Plan B (and its generic versions), ella (the chemical cousin of mifepristone…gasp! ), Depo Provera, Implanon, various IUDs and so on…all ignored in the release and the bill. don’t want to offend those who are killing millions of preborn babies via their faux “contraceptive, now do we? 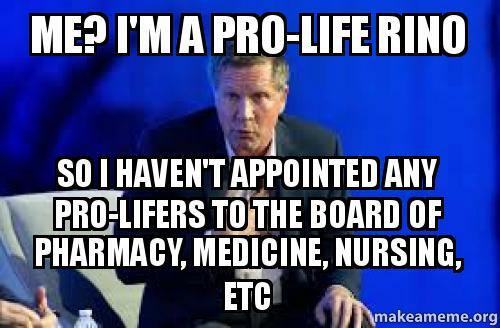 ESH guesses what the OH legislators and their non-pharmacist “consultants” at various pro life groups coulda-shoulda done was consult the real drug specialists in the pro life community the past 31 years, Pharmacists For Life International. ESH has confimed that never occured, a common snub by compromising pro life groups filled with “know nothings”. PFLI is a total protection, 100% pro-life group which doesn’t compromise on principles and that usually too much to bear by those who would, such as National RTL and Ohio RTL. This entry was posted in Catholic, Contraception, Culture, Democracy, freemasons, History, Hypocrites, Klan Parenthood, leftists/communists/marxists, Medicine, Obamacare, Pharmacist, Pharmacy, Politics, Pro-family, Pro-Life, Regime and tagged OH abortion inducing drugs bill abortifacients Pill RU 486. We all know from expeirence in the abortion wars, that the abortoholics–those lovers of killing innocent preborn babies with glee but recoiling at, say, killing a caribou to survive–have wanted to impose THEIR immorality on the rest of normal, life loving everyday folks. They did so in 1973 with the twin abortion decisions of Roe v Wade and Doe v Bolton. They did so with the 1963 Griswold v Connecticut “contraceptive” decision. And with many other lawsuits, to many to mention. With Obamacare, socialized medicine, they want to ram “contraception” and abortion down everyone’s throat, to like it, AND to pay for it. Without apologies. Although some of those impositions are being rolled back–5 decisions now have upheld conscience religious rights of employers and others–many have not. And that doesn’t include at least 38 instances where the Kenyan kommie has rewritten Obamacare rules on his own, by fiat, by his diktat. 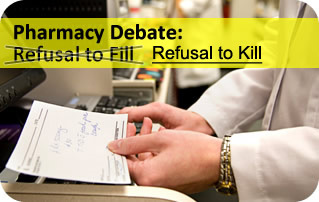 Count on it soon: as part of the Kenyan kommie’s war on Christianity and life, it will soon be mandated: kill or get out of pharmacy or medicine. Period. See here to get an idea where this is heading. It’s parallel twin evil is making sodomites mainstream, loveless sewer “luv” without the requisite propagation of human life as happens with normal marriage within the institution meant only for one man, one woman. This entry was posted in Abortifacients, Abortoholics, Catholic, Contraception, Culture, Democracy, freemasons, History, Hypocrites, Klan Parenthood, leftists/communists/marxists, Medicine, Obamacare, Pharmacist, Pharmacy, Politics, Pro-family, Pro-Life, Regime, Sodomites and tagged Obama diktat conscience rights Himmler.